So wanna know my 2009 New Year’s resolution? Of course you do! I’m on a quest to make the perfect loaf. You know… crusty yet chewy, moist with lots of holes, and complete with a complex flavor. Are you with me yet? I’m talking about bread. My mom taught me to bake a basic white loaf of bread years ago, and I’m ready for bigger and better things. Or at least I aspire to greatness. So, armed with my trusty toaster oven and a husband who stands in for a proper stand mixer when my arm gets too tired, I’m on my way. A few days ago I started my very first sourdough starter, and it is bubbling and brewing away in our bedroom, making our whole house smell a bit yeasty and as if we’ve taken up home brewing. Thankfully we both love the smell… And, yesterday I tried a new bread recipe that I came across during my crash course in advanced baking. It’s called Yeasted English Muffin Bread, and it’s so good that I just had to share it with you! Even if you are a baking novice, you should try this, as it doesn’t involve any kneading or anything. Just mix, stir, wait, and bake! And the outcome is really quite good! Here’s the link, and please let me know if you try it and love it! Today I’m working on my first true sourdough loaves of bread… I’ll let you know how it goes. All in all, in the last 3 days, I’ve baked 5 loaves of bread and started a “starter.” Not a bad way to spend my Chinese New Year’s holiday! Fresh out of the oven, here’s a picture of my first “Country-Style Sourdough.” The results? Soft chewy bread with a thin, crunchy crust. It isn’t that sour, but that’s probably because my starter is only 3 days old and needs to be a lot older before the flavor fully develops. This was my first try with a really wet dough that I had to knead… it was like playing in wet cement. But it turned out just fine, and as you can see from the picture, we’ve already enjoyed a few slices! To be honest, for a first try in this type of bread, the results turned out way better than I expected! Oh, and if you’re curious about my other recipe — it is the No-Knead Sourdough bread. There are a couple of recipe variations, but here’s one of the more popular ones. This one is still rising, and will be until tomorrow… so I can’t tell you how it is yet. If any of you are bread-bakers out there, I’d love to hear your favorite recipes and any tips you might have to share! Funny you should suggest that; that’s actually one of the loaves I’m trying today! It’s in the process of raising for 19 hours… so tomorrow we’ll have it. The only problem is, we don’t have a dutch oven and can’t bake it the proper way, so we’ll just be trying it on a baking sheet. The other bread I’ve tried today is this one: http://www.epicurious.com/recipes/food/reviews/Country-Style-Sourdough-Bread-230913 So, there were 3 recipes, from easiest to hardest. 🙂 The Country Style Sourdough should be coming out of the oven in about 10 minutes! Yum! It smells good. YUM… your bread looks so good. I love the smell of fresh bread. I think I’ll look at your picture and admire your ability, and I won’t have to bake a thing! I couldn’t wait 19 hours to eat something! But, I’m impressed that you can. J.
I am the kind of person that opens things in the grocery store cause I can’t wait. I would have died of impatience 🙂 But YUMMMMMYYYY!!!!!! 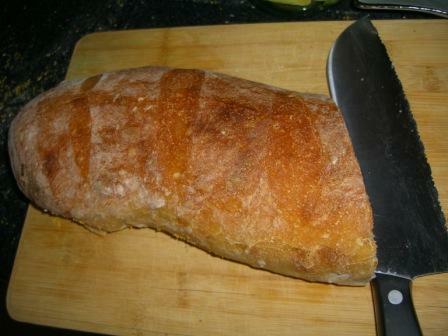 I LOVE homemade bread! Yummy!!!!!!!!! Wow. What a great great blog.Just wanted to let you know that you two are Saints!! And all your pics of the babies are GORGEOUS.